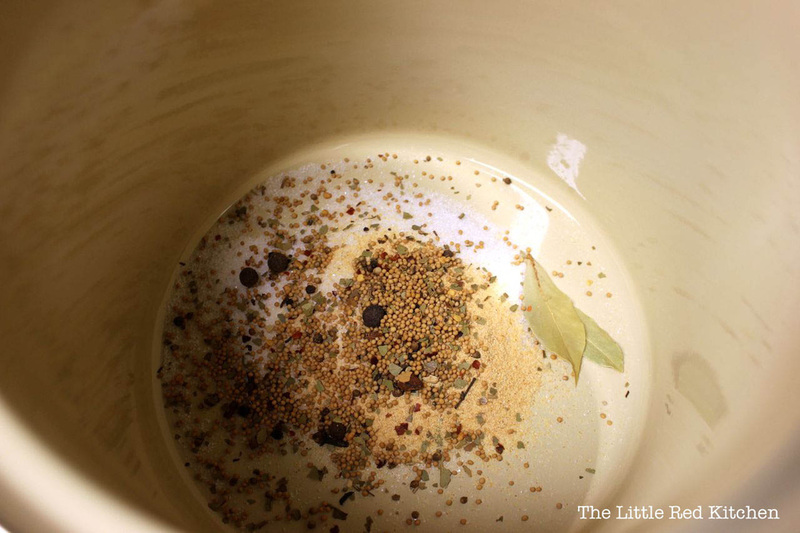 This is one of those recipes that, no matter how many times I make it, I never get sick of. Inevitably, pictures of the perfectly roasted bird end up on my Facebook pages and Instagram. I am not ashamed. 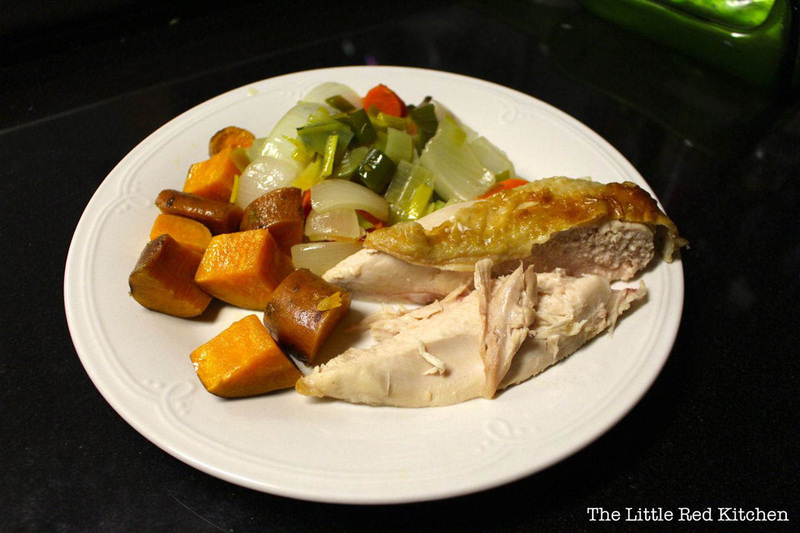 Originally, I was inspired by Nom Nom Paleo‘s “Easiest Roast Chicken Ever*”, which (if you have access to a Trader Joe’s) means an amazing roast chicken dinner on the table in about an hour. Since I didn’t and still don’t have access to Trader Joe’s (and their amazing pre-brined chickens), I had to make do on my own for the chicken-prep part. First, prepare your brine. 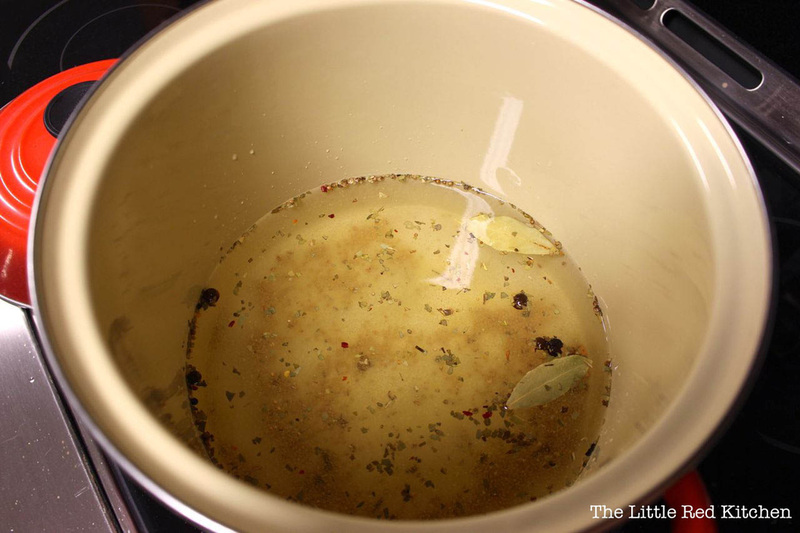 Throw all of the brine ingredients (sea salt through water, above) into a large stock pot (it will need to hold the water and your chicken), and stir well to combine. 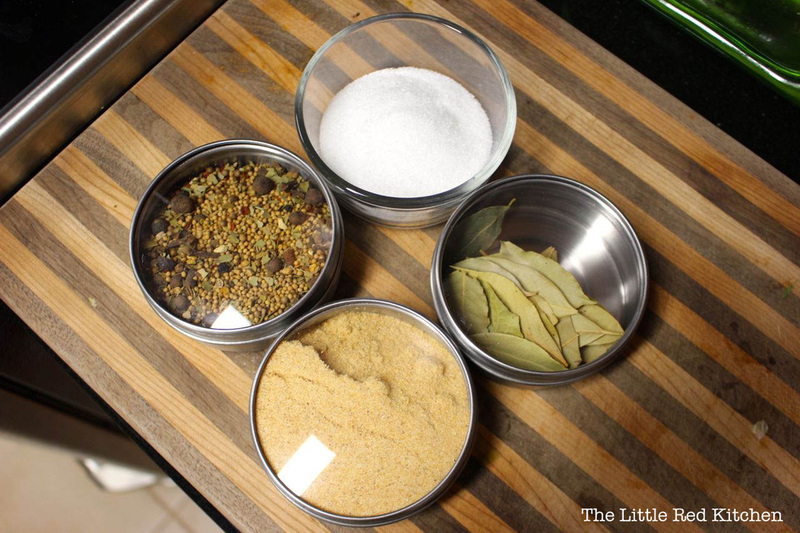 The salt will begin to dissolve as you prep the chicken. Some folks like to simmer the brine first, to ensure that all of the salt has dissolved, but I’ve done it both ways and never had an issue with either one. Next, you’re going to need to know how to butterfly the bird. 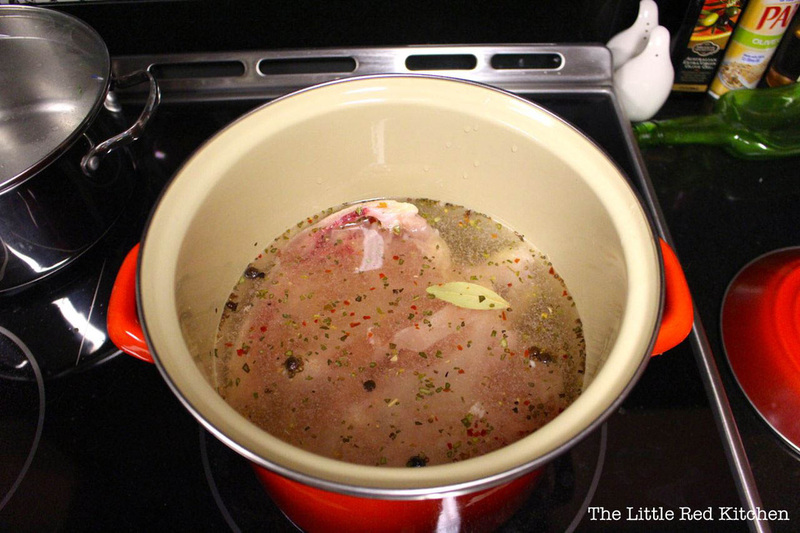 This ensures that it will cook quickly and evenly (that, plus the brine, means fully cooked white and dark meat that’s still super tender). Step 1. 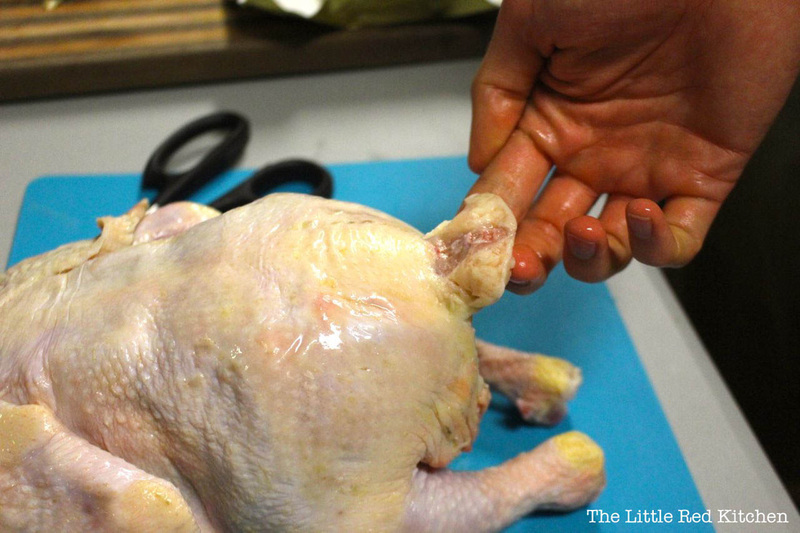 Lay your (now dry) bird on a cutting board (or other easy-to-clean surface, since chickens carry Salmonella spp. ), breast side down. 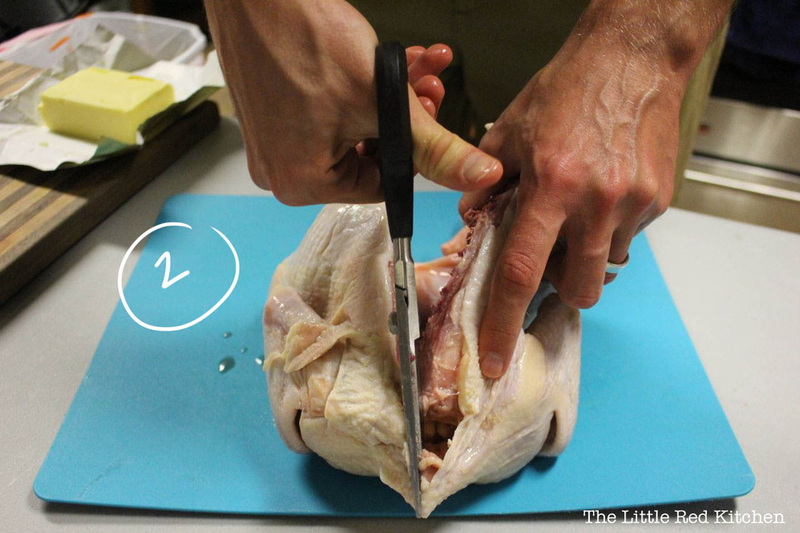 Locate the tail– the backbone runs along the top of the chicken, starting at this point. 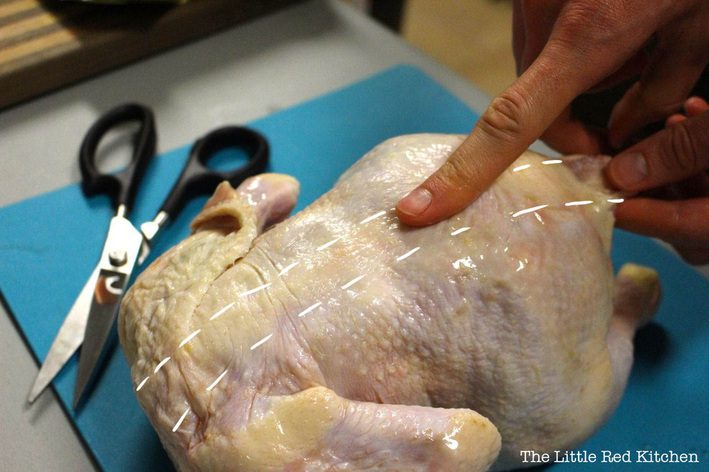 We’ll be cuttingout the backbone, so the chicken will lay flat. Also: BE CAREFUL! Chicken bones are sharp and obviously this guy contains bacteria, so be sure not to cut yourself. If you do, wash your hands really well with some antibacterial soap. Probably twice. Then, repeat on the other side. 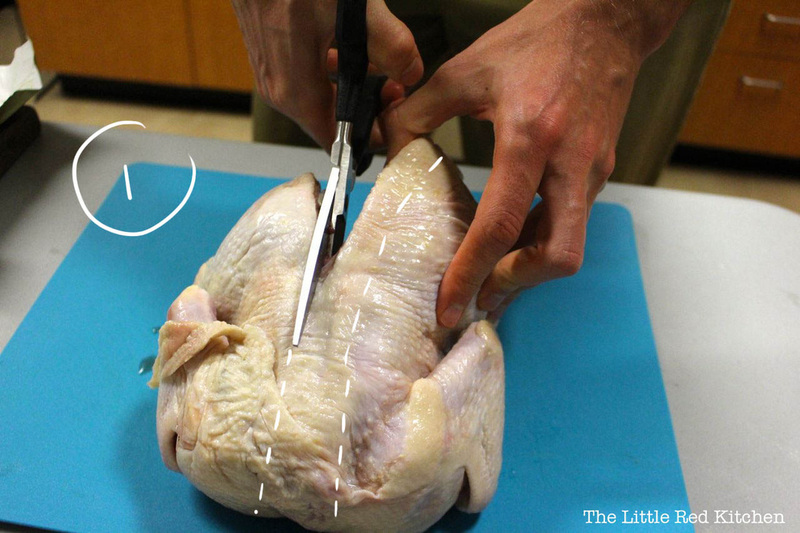 Feel free to turn the chicken around to cut from the other direction, if that’s easier for you (we almost always do). 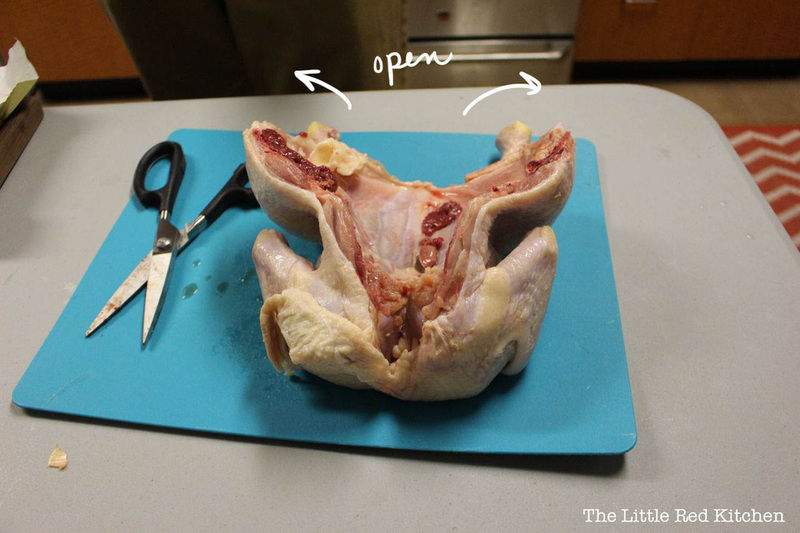 Once the backbone has been removed (great to save for stocks or soups, if you’re into that kind of thing), the chicken should open partway, almost like a book. …which you will use to cut the top ~1 inch of cartilage, starting at the neck region. 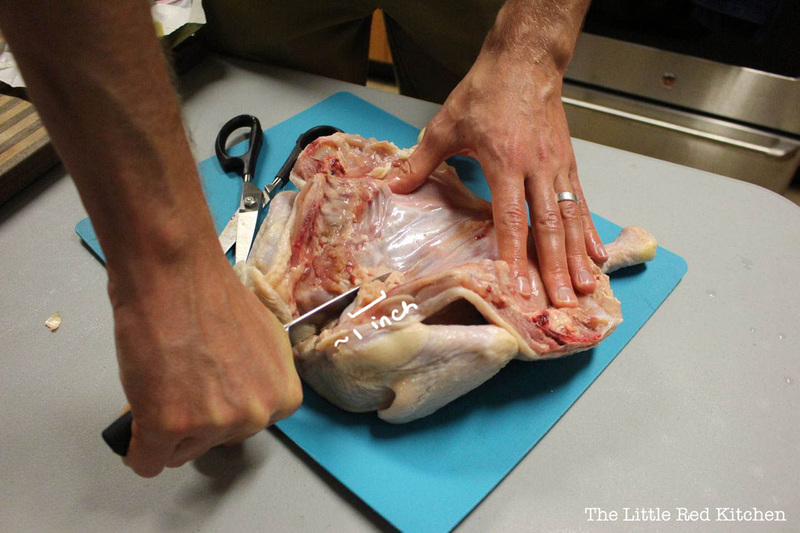 This will separate the breast meat and allow the chicken to lay flat. Step 4. 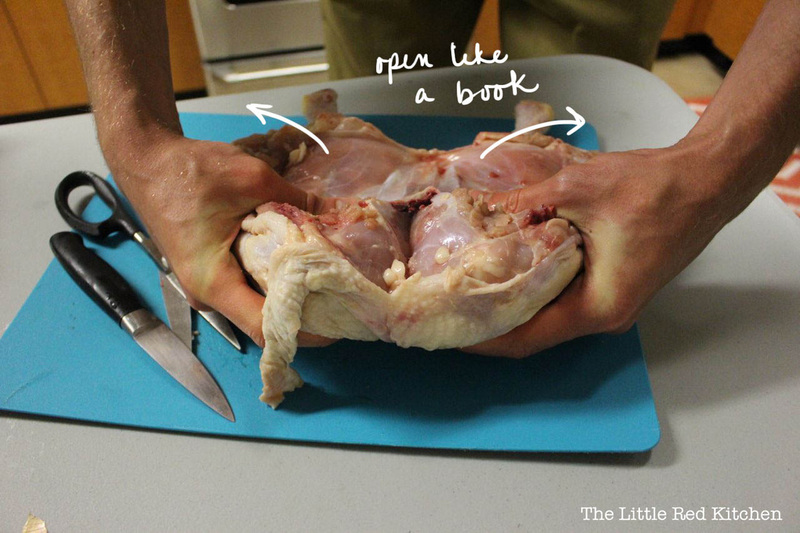 Use your hands to open the chicken like a book. You may have to use a little force, as we’re going to separate the cartilage in this step. 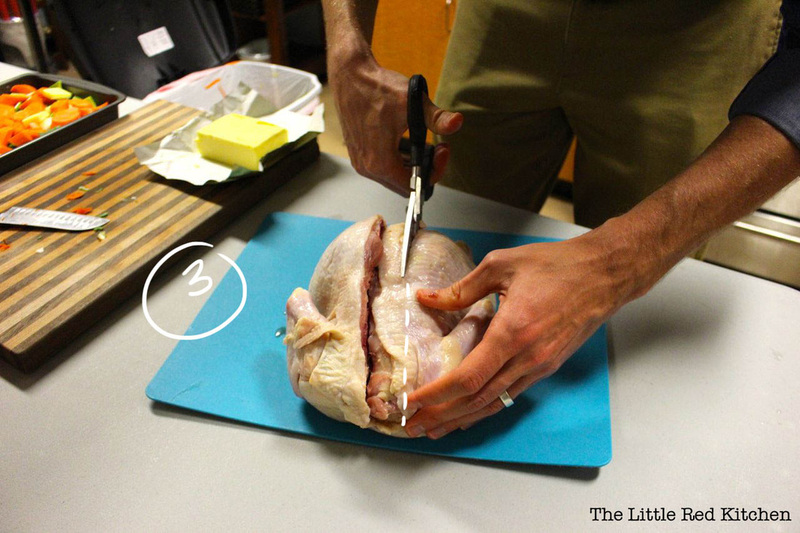 Optional step: Using a sharp paring knife, carefully remove the keel bone. Some folks like to do this, and I definitely do (unless I’m feeling lazy)! This won’t affect the cooking time or flavor of the chicken, but this is what you’d normally cut the breast meat off of. 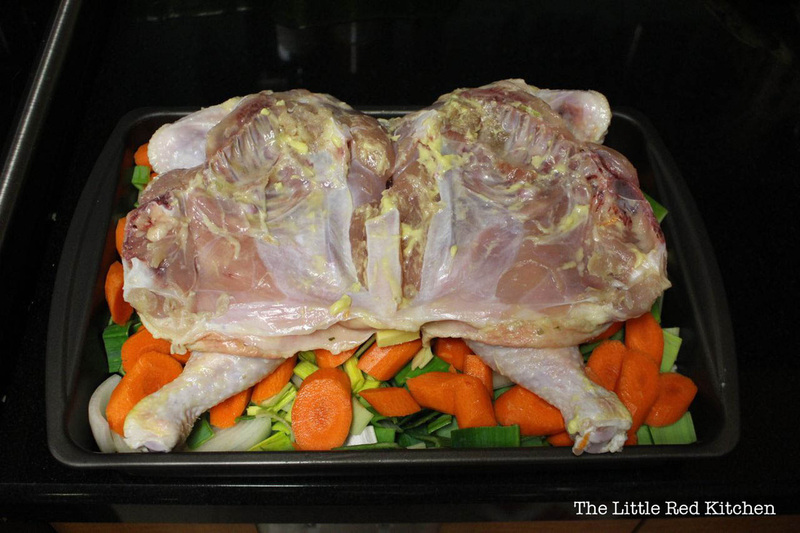 Without the keel bone, there are no bones keeping you from white meat bliss after this baby is done cooking! Step 5. 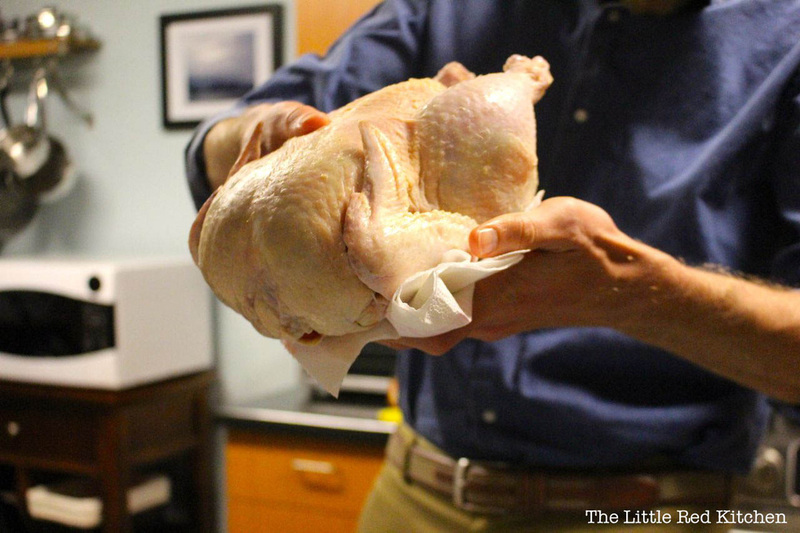 Put your chicken in the brine at room temperature for 30-45 minutes. Step 6. 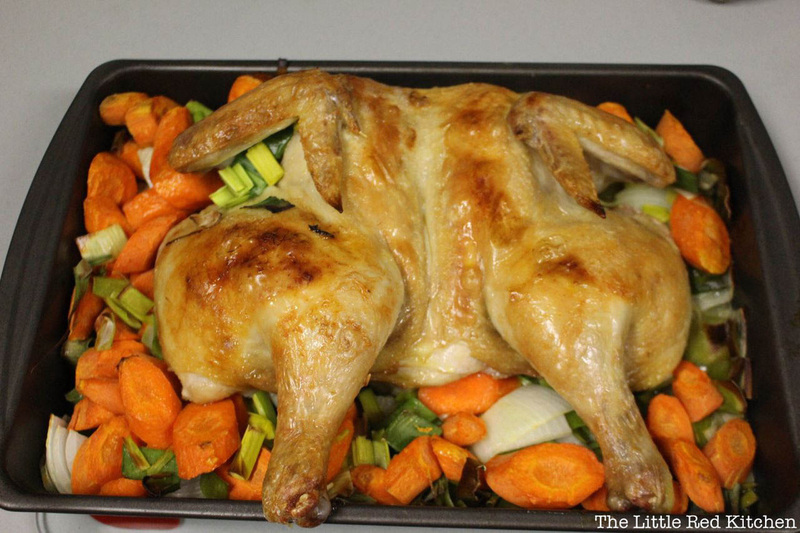 While your bird is brining, preheat your oven to 425 degrees F. Then, prep and roughly chop your favorite root vegetables, and throw them into a baking pan (that will also fit your chicken). If you’re feeling especially decadent, add some pats of butter to the top of the veggies (or toss with your favorite cooking oil). 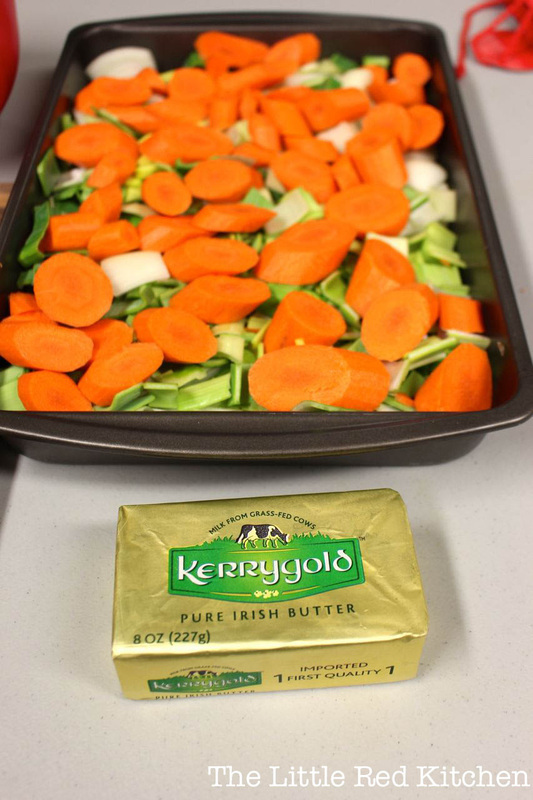 Kerrygold is arguably the best butter, ever. 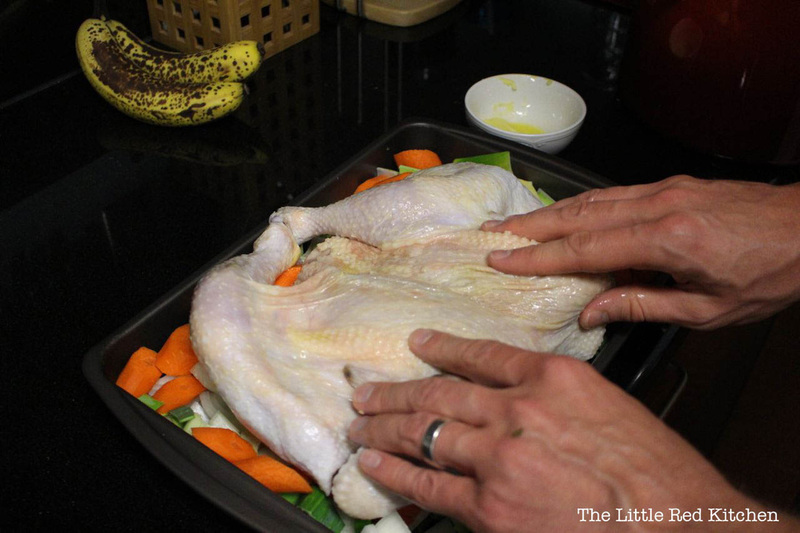 Pat the bird dry, and rub down with a generous coat of softened butter or your favorite cooking oil (both sides). Step 8. 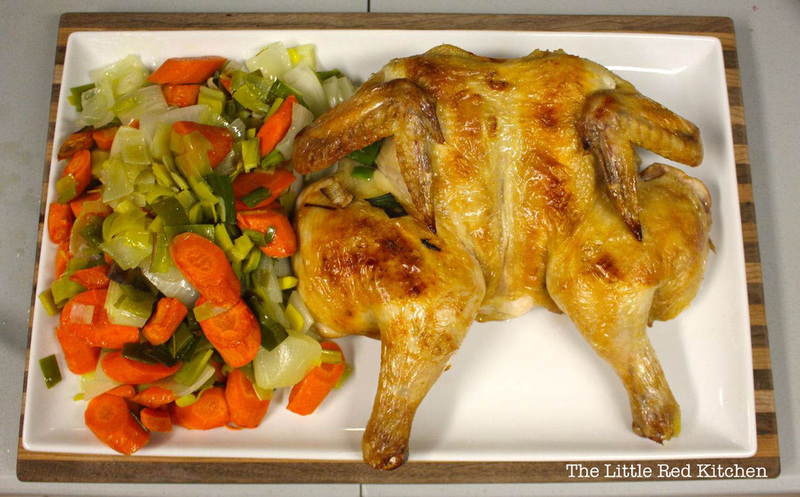 Place the chicken breast-side down on the tray of vegetables, and make sure it fits within the tray. Step 10. 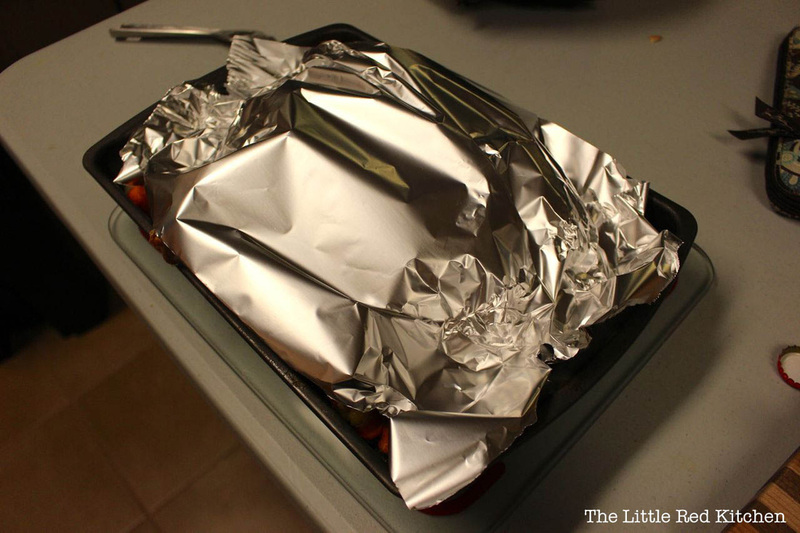 Tent the chicken in tinfoil for 15-20 minutes. Step 11. 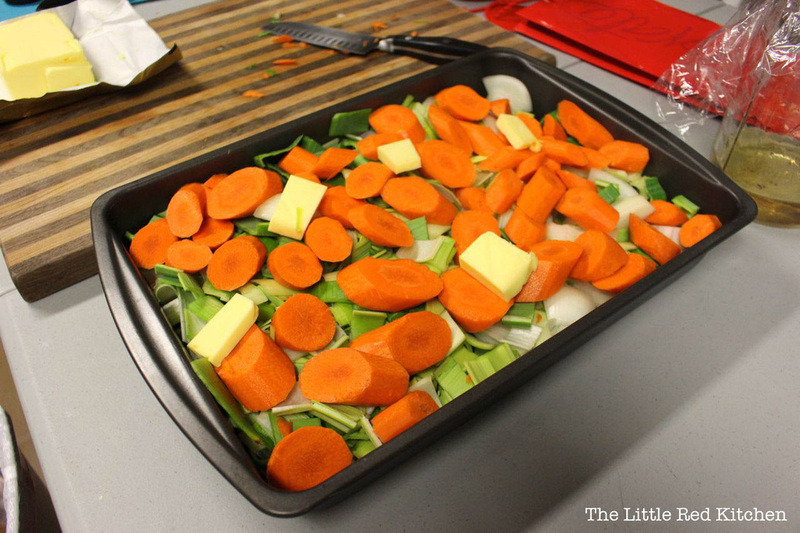 Then serve up alongside the vegetables you just roasted under the chicken! Delicious.